Author Domenica Ruta stood in front of the senior Writers Institute class of Memoir/Fiction Writing. Her arms were folded, her long brown hair hung over her shoulders. Ruta is the author of the celebrated memoir “With or Without You,” and visited Murrow’s Writers Institute to share her story and tips for how to write memoirs. “Let’s start by writing a list of the five most intense conversations you’ve been a part of,” Ruta said. Students began to hold their pencils and pens at the ready, thinking hard about their own personal memories. One by one, the seniors started to scribble furiously in their notebooks. Jaali Michael-Phillips had already filled up three pages of her journal when Ruta called for pencils down. Ruta then handed out two books: her first memoir “With or Without You” and the first fully completed manuscript of the novel she recently completed, “Last Day.” The seniors passed them around, reading a few pages and devouring the blurbs. “With or Without You,” described by the New York Times Book Review as “a luminous, layered accomplishment,” was published in 2013 and depicts Ruta’s complicated childhood and relationship with her mother. The book exhibits a painful coming of age story that also consists of cynical humor and triumph. When Ruta was young, growing up in north Boston, she was exposed to her mother’s drug addiction by her mother who was herself an addict and a dealer. Yet the story portrays Kathi Ruta as a source of inspiration for Domenica, who fueled her love of storytelling by allowing her to stay home from school, do opiates and watch The Godfather and Woody Allen classics. However, Ruta also noted that maybe it would be good for her son to read the book and be able to get to know his grandmother from afar, through her own words. 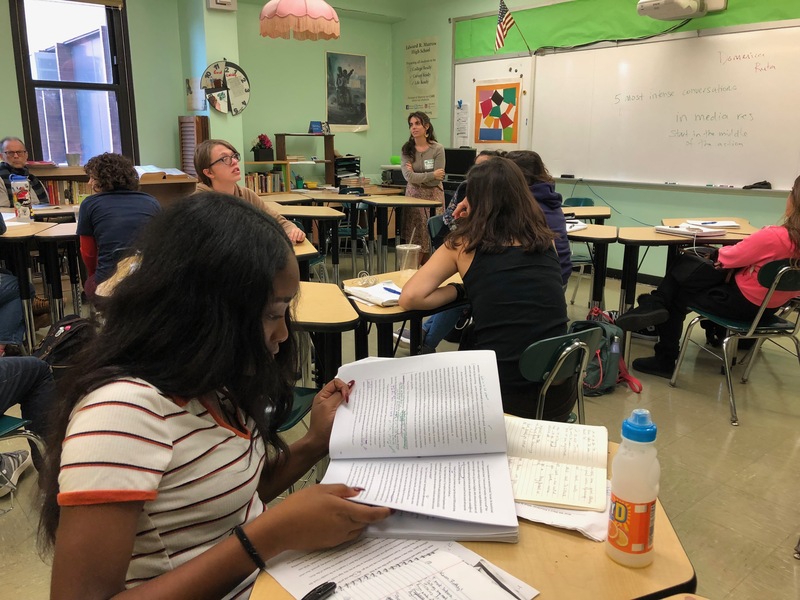 As the class discussed what it takes to write a good memoir, students kept raising their hands with questions about her process and personal life. “What do you do in your free-time?” Asked Daphne Parkhill. “How old is your son?” Nora Carrier chimes in. “When did you figure out you wanted to be a writer?” Asks Kevin Rutledge. Ruta explained that she is a single mother who teaches memoir writing to undergraduates and graduates at Sarah Lawrence College. She began writing pretty early on, as she had a knack for storytelling. When she’s not teaching, she’s running, writing and taking care of her three-year-old son. She also collaborates with a non-profit organization that provides support for single working mothers. “How do you determine what to cut and what to keep?” Asked Senior Writer’s Institute teacher Mr. John Faciano. Ruta left the class with some advice, while the students hung on every word.